Saturday saw us at two events in Riverside. The first was at Habitat for Humanity's Riverside ReStore where items salvaged from the historic Fox Theater were made available for purchase. The once in a lifetime event drew dozens to Habitat's store early Saturday morning for first pick of the lot, with several pieces sold (one | two | three) within a few hours. The items -- doors, windows and power switches -- were recently donated to the Old Riverside Foundation, which in cooperation with Riverside ReStore, is selling the items. Proceeds will help benefit historic preservation efforts of Old Riverside Foundation as well as support Riverside's Habitat for Humanity home ownership mission. Perfect for just about any home and business -- or simply as a great accent for the garden -- these unique "art" pieces will remain on sale at Riverside ReStore until sold. Later in the afternoon, we headed downtown to the 14th annual Show and Go classic car event. Over 1,000 cars -- mostly from the 1950s and 1960s -- were parked and open for close inspection for several blocks along downtown streets. 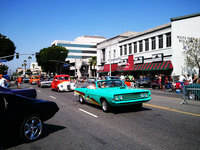 The event included a slow cruise down Market Street, allowing the cars to flex their muscles to curbside spectators. Noted designer Chip Foose was even on hand signing autographs. The three-day car show also has numerous car product booths (including Riverside's K&N Filters and Wayne's Engine Rebuilders) as well as several food vendors (including a beer truck from Hanger 24 Brewery in Redlands). The Show and Go continues on Sunday, May 6. 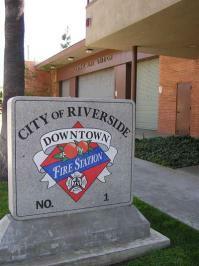 Want to own a piece of Riverside history? Here's your chance! 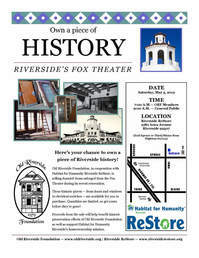 In cooperation with Habitat for Humanity Riverside, the Old Riverside Foundation is selling recently donated items salvaged from the historic Riverside Fox Theater. The items -- doors, windows and power switches -- were saved during the theater's 3-year, $32 million renovation that was completed in 2010. We think the doors and windows would make a nice historic art piece for anyone's home or business. They could also be an interesting trellis or accent for any backyard garden. And the power switches would add interesting color to any mantle or wall. The sale begins Saturday, May 5 at Habitat for Humanity's Riverside ReStore, located at 2180 Iowa Avenue (near Spruce Street). 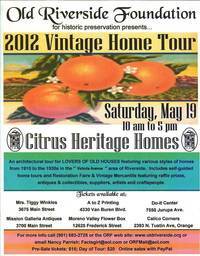 Proceeds will help benefit historic preservation efforts of Old Riverside Foundation as well as support Habitat for Humanity Riverside's home ownership mission. 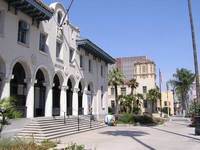 One of downtown Riverside's oldest buildings dating from the late 1800s will soon disappear as a plan for an arts school for Riverside Community College District moves forward. Located at the southwest corner of Market Street and University Avenue, the building in question was originally built as a sanitarium by Dr. Clark Whittier, a wealthy Canadian who bought what was then a muddy marsh in 1881. 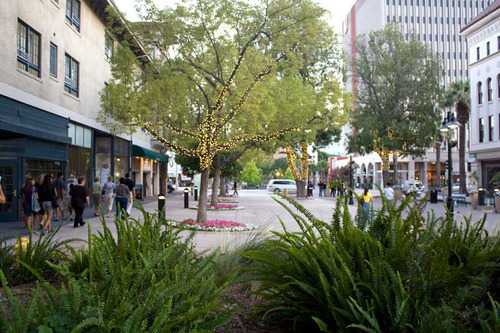 Bounded by Market, Chestnut, Eighth (University) and Tenth streets, the unimproved land had been designated for public use following the removal of similar plans on land bounded by Market, Main, Seventh (Mission Inn) and Eighth (University) streets (where the California Tower stands today). In 1894, Whittier's widow sold the building to David and Flora Cochrane for $12,000. The Cochranes, also of Canada, remodeled the rooms and renamed the building Hotel Holyrood in 1895. The new name was likely in reference to the Holyrood district of Edinburgh, Scotland (and a nod to David's Scottish roots). In 1900, the Cochranes added large expansions along both Eighth and Market streets, increasing the hotel's size to accommodate 100 guests. 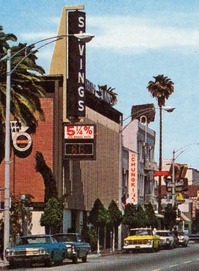 Following the remodeling, the building was renamed Hotel Plaza -- a name that would last atop the building well into the 1990s (view back of sign @1970). We're not certain when rooms stopped being rented, but a 1980 newspaper article about possible redevelopment for a "modern high-rise" indicates rooms were still occupied. More recently, we seem to recall upper spaces still in use during the mid- to late-1990s. City permits show the various street level spaces housed several commercial entities over the years, including at least one restaurant (Chung King), two furniture stores (Riverside Home Appliance, Raymonds), a shoe store (Greenwood Shoe), a print shop (American Speedy Printing), a market and deli (Atlas Market), a development firm (Peri & Associates), a skateboard shop (Crooks) and a psychic reader (Psychic Experience). 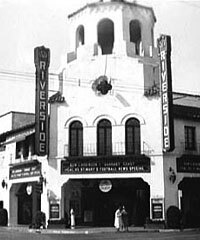 Though not a particularly striking building in its own right, we've come to admire the old Hotel Plaza building more in recent years, mostly for its place in downtown Riverside's early history. But we've also come to appreciate its old-school "urbanity" -- fire escapes, cluttered backside -- not found much these days, particularly in predominately suburban towns like Riverside. Along with the demolition of all three buildings that comprise the Hotel Holyrood/Plaza, an adjacent building along Market Street will also come down. Together, the four structures are to be replaced by a $24 million, 51,600 sq. ft. building that will house RCC's Culinary Arts Academy and administrative offices. The new three-story building will include a rooftop reception area. Completion is expected by April 2014. Situated behind the new Culinary Arts building will be the focal point of the district's overall arts school plan -- the $63.2 million, 88,862 sq. ft. Henry W. and Alice Edna School for the Arts**, which received a $5 million grant from longtime local builder Henry Coil Jr. It will include two levels of underground parking and be situated on an existing parking lot behind the Market Street buildings. This later phase is expected to be completed by Fall 2015. 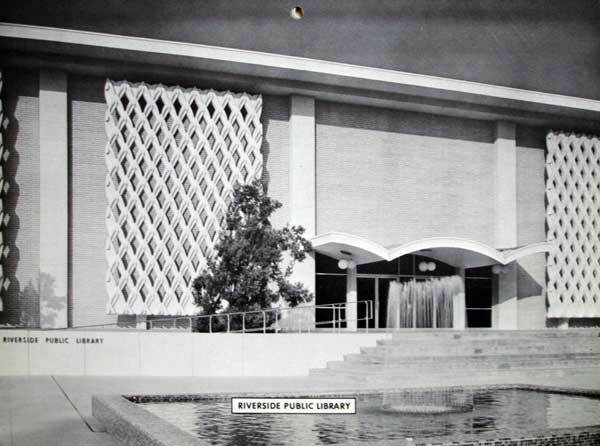 One exception to the overall demolition plans on the site is the restoration of the former Riverside Finance/Citrus Belt/Sterling Savings building. 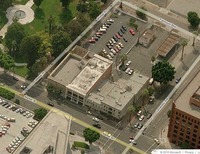 Located on Market Street adjacent to White Park, it will be remade into the $6.3 million, 11,000 sq. ft. Center for Social Justice and Civil Liberties. 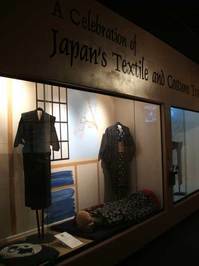 Expected to open in June 2012, the center will contain two floors of gallery space and house the college's Mine Okubo archival collection. 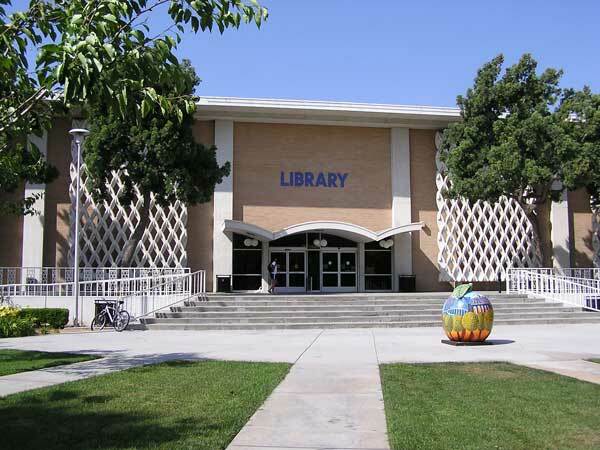 Riverside-native Okubo was a Japanese American civil rights advocate and alumnus of RCC. She bequeathed her collection to the college upon her death in February 2001. Plans have been completed for the handsome new office building of the Riverside Finance Company, at Market Street and Whittier Place. ... (the building) emphasizes a classical architectural design ... with an arched entrance of distinctive metropolitan character. ... The ceiling will be unusually high, giving a dignified and attractive effect to the interior of the building. 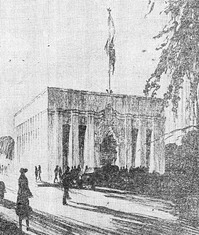 The classic facade was later hidden behind a flat stucco wall held up by steel beams added around the bank (and adjacent building). The wall was then partially shielded by thin, horizontal slats, giving the building a sleek and modern look popular at the time. City permits seem to indicate this took place in 1961 for then-tenant Citrus Belt Savings & Loan. Through the years, at least two other banks -- Sterling Savings & Loan and Imperial Savings -- have also occupied the space (we also recall Provident Savings Bank may have had a branch there at some point as well). A few years back, a hole was punched into the front stucco facade, revealing the still-existing, 1926 Spanish Baroque (Churrigueresque) facade. This revelation no doubt helped save the building as part of the upcoming arts school complex. 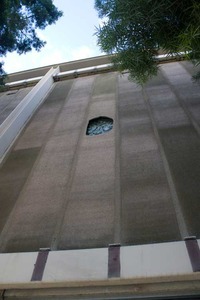 In a ground-breaking ceremony held last Thursday for the project, college officials finally unveiled the classic facade. Down came the stucco wall and portions of brick veneer on the side of the building. Also removed was some form of faux marble veneer at the base of the building, revealing brick underneath (which is likely a covering of some sorts as well). Overall, the 1926 facade looks to be in relatively good shape, though there are portions that appear to have been damaged and possibly even shaved down during the 1961 covering. Hopefully, the refurbishment will be able to fully restore these portions. The first of two old-style neon signs went up this past week on the Fox Performing Arts Center in downtown Riverside. The signs are replicas of those that adorned the theater in the 1930s and 1940s. According to The Press-Enterprise, the signs are 22 feet tall and weigh 900 pounds each. The cost to create and install them was $70,000. According to Fox personnel, the second 'blade' sign will be hung next week, at which time both signs should be operational. The signs are among the final touches to the newly-renovated Fox theater, which reopened earlier this year as the city's long-awaited performing arts center. 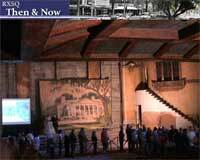 The 1929-era theater received an extensive rehab that began in 2007. City officials aren't sure what happened to the original 'blade' signs, but believe they were removed sometime during the 1950s. Last month, workers began dismantling the interiors of twin buildings located adjacent to the Fox on Market Street as phase two of the Fox project. The facades of the twin buildings were saved and will be incorporated into an arcade that will partially shield sidewalks and a new outdoor plaza from the street. Dubbed as Fox Entertainment Plaza, the development includes a 400-space parking garage, small "black box" theater, 12,000 square feet of commercial space and a 10,000 sq. ft. exhibit hall. Completion is expected in Spring of 2012. This past week marked the opening of UC Riverside's Barbara & Art Culver Center of the Arts, adding another major arts facility to downtown. 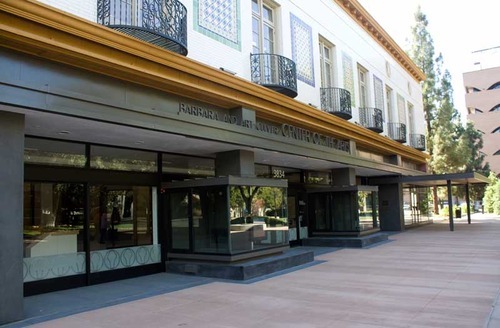 Located adjacent to the existing UCR/CMP (California Museum of Photography), the Culver Center expands UCR's ARTSblock presence on the main street pedestrian mall. In addition to hosting its own arts programs, including dance, music and film, the three-level Culver Center is also the new home for the university's Sweeney Art Galley. It also houses -- via seismically safe storage cases -- the CMP's world-renown Keystone-Mast collection of stereoscopic glass negatives. The center resides within the former Rouse's department store*, which dates to 1895 as the Chapman Building, one of the oldest on the downtown mall. 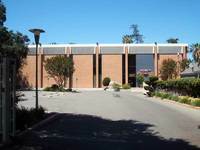 The current configuration actually takes in two sections, 3834 and 3850 Main Street. According to city permits, the latter (and smaller portion) was built in 1917. Various renovations and refurbishments have been made to the building over the years, including some exterior upgrades in the early- to mid-1950s (metal canopy and touches of stonework). But the most extensive makeover came around 1925 (though some reports indicate 1924 or 1927), when Rouse's expanded onto the second floor. 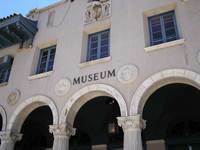 Noted architect G. Stanley Wilson added a grand staircase inside and re-faced the exterior facade with Spanish-influenced tiles, bas-relief and iron work, much of which remains today. Known for high-end clothing, the original Rouse's lasted until 1957 before being leased out (in name) to other interests. By 1964, just two years before the opening of the pedestrian mall, the store had closed. With a few exceptions, including Casual Gourmet Restaurant, Spanky's Cafe and The Tamale Factory, the building has remained mostly vacant since. 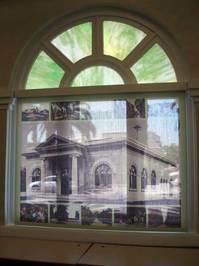 Old images highlight the building's central atrium, which has been restored**. The new center also has a spot for a yet-to-be filled indoor-outdoor cafe, which would be a nice addition to this portion of the pedestrian mall. 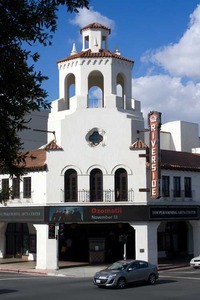 The Culver Center follows the recent opening of the Fox Performing Arts Center and adds to the city's growing collection of arts-related facilities and institutions, including among others, the California-Riverside Ballet of Arts, Riverside Art Museum, Riverside Metropolitan Museum, Mission Inn Museum, Riverside Community Arts Association, Performance Riverside, Division Nine Gallery and The People's Gallery. 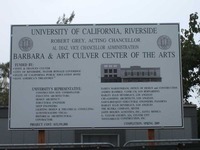 Another planned downtown arts facility -- Riverside Community College's "Henry W. and Alice Edna Coil School for the Arts" -- is tentatively scheduled for a 2014 opening. While driving down Market Street last month, we stumbled upon a bit of local history. Standing alongside downtown's Fox Performing Arts Center was an uncovered facade revealing what once was the former home of long-time Riverside car dealer De Anza Chevrolet (one | two). City permits indicate the building (and its adjacent twin) housed a number of businesses over the years, including automotive, printing and antiques. A 1924 building permit gave the two buildings an estimated value of $35,000. Currently, the buildings are undergoing demolition as part of the next phase in the Fox Performing Arts Center development. This past week, workers began dismantling the interiors of the twin buildings. Their facades are being secured (one | two) for use as an arcade that will partially shield sidewalks and a new outdoor plaza from the street. Once completed, the project will include a 400-space parking garage, small "black box" theater and a few commercial spaces. Back to De Anza Chevrolet ... we're not exactly sure when the dealer opened shop within the Market Street building, but city permits show them at the location by the late 1940s. In the early 1960s, however, 7 new car dealers downtown -- including De Anza -- came together to build the Riverside Auto Center. When it opened alongside the 91 Freeway at Adams Street in 1965, this new "auto center" was the first of its kind in the U.S., garnering attention even from Detroit's automakers. Though it remains today, De Anza Chevrolet is now known as Singh Chevrolet. This past weekend saw us out and about downtown on both Friday and Saturday. On Friday evening, downtown was relatively busy as a special screening of "Gone With the Wind" brought a sold-out audience to the newly-restored Fox Performing Arts Center. The showing included appearances from 4 of the 7 surviving cast members at a special gala held before Friday's re-screening. While downtown, we took an impromptu tour of the Mission Inn, following it up with a bite to eat at one of the hotel's unique eateries. Later, we strolled along the Main Street pedestrian mall, which was alive with other downtown patrons. Saturday morning found the pedestrian mall and weekly farmer's market busy with both shoppers and walkers alike. A re-opened Simple Simon's helped keep the outdoor dining area filled with folks taking advantage of the mild summer temperatures. Nearby, we spotted the emergence of the former De Anza Chevrolet behind a recently-removed facade on Market Street (one | two). In the early 1960s, 7 new car dealers downtown -- including De Anza -- came together to build the Riverside Auto Center, which was the first auto center of its kind when it opened in 1965 alongside the 91 Freeway at Adams Street. Today, De Anza Chevrolet, one of the seven original auto center dealers, is known as Singh Chevrolet. Crowds flocked to the new Fox Performing Arts Center in downtown Riverside this past weekend to catch an inside look at the newly-renovated facility following a 3-year, $32 million renovation. 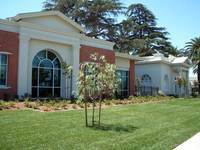 Friday night was the grand opening, fund-raising gala while Saturday and Sunday were open house days. Judging by the looks on the faces of those who attended, no one walked away disappointed. This coming weekend will be the center's first official event -- two nights of Sheryl Crow. Make no mistake, this was an extensive -- and expensive -- top-to-bottom, inside-and-out renovation. No detail was left undone. And as a result, the Fox is now a first-class music and Broadway-caliber venue. 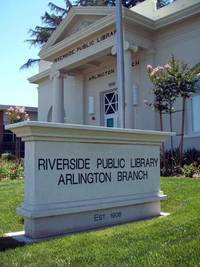 And one that Riverside -- and Inland Southern California as a whole -- can indeed be proud of. So get out there and enjoy the new Fox. 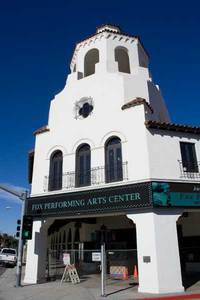 After nearly 3 years of renovation -- and several years of planning -- downtown Riverside's Fox Theater is ready to make its debut as the Fox Performing Arts Center. 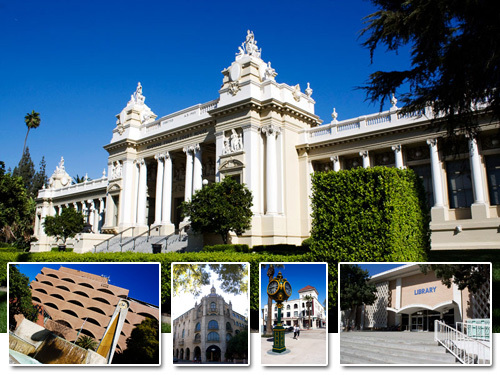 Located at the intersection of Mission Inn Avenue and Market Street, the 1,642-seat Fox Center is the crown jewel of Riverside's 5-year, $1.6 billion "renaissance" public works plan. At just over $32 million, the complete renovation -- including Broadway-caliber staging -- of the 1929-era Fox is also one of the most expensive projects in the 5-year plan, which began in late 2006. Friday evening Jan. 15 marks the official opening of the new center with the "Fox Foundation Inaugural Gala," a $150-ticket special event intended to show off the Fox as well as begin the process of establishing a community endowment to assist in maintaining and operating the new performance center.